Our practice has been built on our reputations of expertise and specialized training. 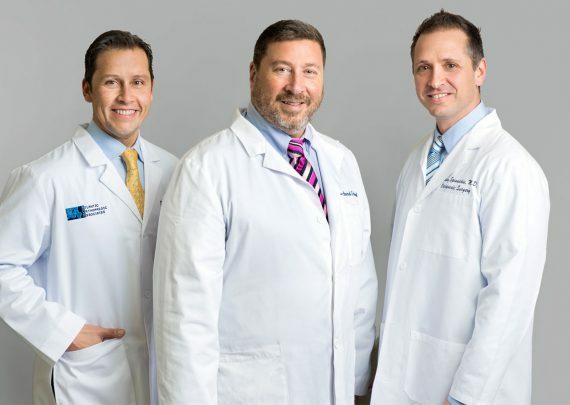 Doctors Schenk (center), Grob (left) and Spinnickie (right) are among the most qualified Orthopaedic surgeons in New Jersey who are active members in local, state and national Orthopaedic community committees and societies. They routinely attend and teach at national and international conferences, often lecturing in the most up-to-date techniques and treatments. All three doctors are fellowship trained in Orthopaedic Trauma Surgery and are board certified orthopaedic surgeons. Many of our patients are transferred into the care of our physicians as a result of their reputations of expertise and ability to repair complex injuries, otherwise thought to be non-salvageable. Onsite digital x-ray system to ensure accuracy of diagnosis, medical improvement and surgical planning. ©2018 - Atlantic Orthopaedic Associates - All Rights Reserved.